For DFF Olga Grotova and Zach Dawson present a collaborative project where they interpret diagrammatic ‘scores’, which propose multiple connections of sound to physical materials, light, and time as a starting point. The scores, presented as physical objects using various materials and medium (glass, mirror, paint), become part of the fabric of the exhibition, framed as visual representations of the sonic process generated through performance. Every aspect of the ‘score’, musical notation, line, shape, is freely interpreted to engender new contexts and meanings. production remains fixed in its choreography, but at the same time freely adapts to the circumstances. McCarthy in 2015-2016. In 2018 she organised a performance titled “The First Reading of the Book” with the members of the group at Mimosa House in London. In 2012 Grotova produced a publication “A Joyful Archipelago” with the support from the Outset. In 2016, Olga Grotova was shortlisted for the South London Gallery Graduate Residency and the same year for the Land Securities Award. Selected exhibitions include Mimosa House (London), Coventry Biennial, Osnova Gallery (Moscow). 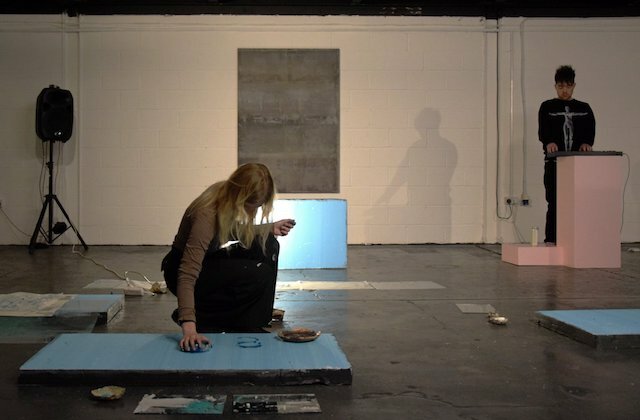 Grotova has previously exhibited at Centrala in 2016 as a part of ‘Seventeen’, a three-person exhibition, where she showed paintings and her video work ‘One’ (2016). Post-Paradise Series is a grassroots experimental music series run by a collective of composers based in Birmingham, UK.